← THE FIRST “NOTES FROM A COMPOSER“ BLOG POST … Or Why am I doing this, really, why? THE SPEAKEASY INTRODUCTION – A fantastical musical of Prohibition era NYC Queer life. “Speakeasy – John and Jane Allison in the Wonderland” is a big full-length musical, generously over-stuffed with memorable songs, that cleverly adapts Lewis Carroll’s Alice books to take its audience on a fantastic journey through the little known vibrant Queer culture of Prohibition era New York City. Love and Identity in their many facets are explored in surprising, whimsical and ultimately profound ways in an evening full of song, dance, laughter, heartbreak and adventure. John and Jane Allison are newlyweds in 1929/30 New York. Although they love each other, they have desires they haven’t even acknowledged to themselves, let alone explored. But after giving her neighbor Roberta White a kiss, and running after her, Jane enters a basement Speakeasy to find herself in a strange world where time and space and identity don’t appear to follow conventional rules. John too enters this world in his own way: after accepting a sexual proposition in a public men’s room he mysteriously slides through the bathroom mirror. Thus Jane goes “down the rabbit hole” and John falls “through the looking glass”. 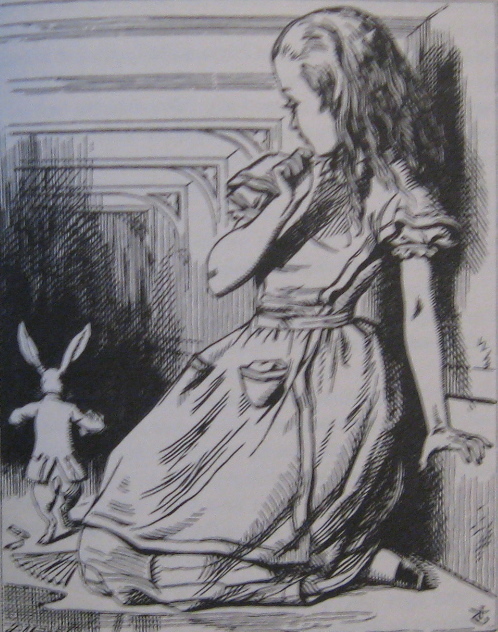 Their adventures, first separate, then together, mirror Alice’s Adventures in Wonderland and Through the Looking Glass, only with Carroll’s characters and events transformed into characters and events from New York City’s Prohibition era culture. The Wonderland is now a nightclub run by Master of Ceremonies Chet Cheshire, based on Gene (Jean) Malin, the openly homosexual headline act of New York’s short-lived Pansy Craze of 1929. The Wonderland’s favorite double act, The Tweedle Sisters (Dora and DeeDee), are loosely based on Vaudeville’s famous Dolly Sisters. Jane and John meet Duchess Bentley, based on the larger than life black lesbian singer Gladys Bentley, as well as Julian Carnation, based on the popular female impersonator Julian Eltinge. Through their friendships and subsequent love affairs with these characters, John and Jane, in one magical realist dream night, experience many facets of Prohibition era Queer culture, including sexually and racially inclusive speakeasies, buffet flat parties, police raids, and the grand Jefferson Lodge Ball, inspired by the real-life Hamilton Lodge Ball, where up to two thousand cross-dressing costumed men (and women) danced while up to three thousand spectators watched from the balconies. By the night’s end, John and Jane must confront each other’s hidden sexuality and infidelity. At the same time the free-spirited world of the Wonderland is brought to a halt by a bizarre, Carrollesque Trial, mirroring the end of Prohibition and the tightening of moral strictures that followed in the early 1930’s. Duchess Bentley, Julian Carnation and Chet Cheshire each endure reversals of fortunes and societal repression that echo their real life counterparts’ histories. Finally John and Jane rebel against the Trial’s “stuff and nonsense”, cause great chaos (just as Alice does at the end of both Wonderland books) and wake up from their mutual dream, Jane alone on her couch and John in a subway car. But will they reveal their “dreams” to each other and “speak easy” about the truth of themselves? This entry was posted in LGBTQ Alphabet Soup, The Speakeasy Chronicles and tagged 1920s, 1930s, Alice in Wonderland, Gene Malin, Gladys Bentley, Julian Eltinge, Lewis Carroll, musical, New York City, Prohibition, Queer, Speakeasy, The Dolly Sisters, Through the Looking Glass, Wonderland. Bookmark the permalink. 3 Responses to THE SPEAKEASY INTRODUCTION – A fantastical musical of Prohibition era NYC Queer life. I’ve listened to this entire musical, and it’s MAGNIFICIENT!!! TRULY OUTSTANDING!!!! So I’m very excited you have this website, and are boggling and tweeting to get the word out. Everyone deserves the opportunity to see and enjoy this musical. I can’t wait for opening night!! !